You'll be £10.00 closer to your next £10.00 credit when you purchase Marie Antoinette’s Confidante. What's this? Marie Antoinette has always fascinated readers worldwide. Yet perhaps no one knew her better than one of her closest confidantes, Marie Thérèse, the Princesse de Lamballe. The Princess became superintendent of the Queen’s household in 1774, and through her relationship with Marie Antoinette, a unique perspective of the lavishness and daily intrigue at Versailles is exposed. Born into the famous House of Savoy in Turin, Italy, Marie Thérèse was married at the age of seventeen to the Prince de Lamballe; heir to one of the richest fortunes in France. He transported her to the gold-leafed and glittering chandeliered halls of the Château de Versailles, where she soon found herself immersed in the political and sexual scandals that surrounded the royal court. As the plotters and planners of Versailles sought, at all costs, to gain the favour of Louis XVI and his Queen, the Princesse de Lamballe was there to witness it all. This book reveals the Princesse de Lamballe’s version of these events and is based on a wide variety of historical sources, helping to capture the waning days and grisly demise of the French monarchy. The story immerses you in a world of titillating sexual rumours, blood-thirsty revolutionaries, and hair-raising escape attempts and is a must read for anyone interested in Marie Antoinette, the origins of the French Revolution, or life in the late 18th Century. This beautifully written history of Louis XVI, Queen Marie Antoinette and the French Revolution, is seen from the perspective of the queen’s confidante and friend, the Princesse de Lamballe. The author’s interpretation of well known and little known incidents leading to the violent and tragic climax, is believable and extensively documented. I found the role of the gutter press of the day, and the Paris mob, was particularly relevant and fascinating, and one draws parallels with current world events. I have handed the book to my wife, because I know that she will be very interested in the detailed descriptions of life in the royal court at Versailles. What's good is that it does give us insight to the elite court from beyond just the view of the Louis XVI and Marie Antoinette. She deserves to be remembered for more than her gruesome death. 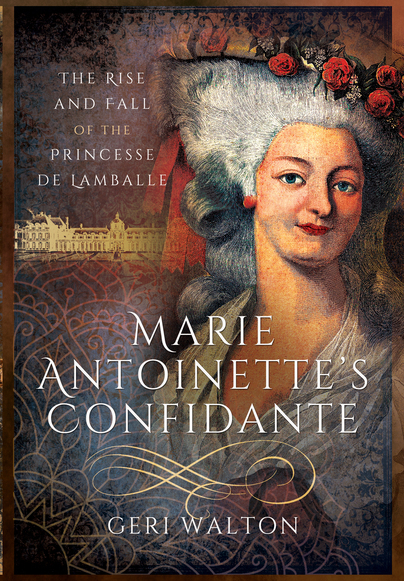 Marie Antoinette boasts one of history's most recognisable names, and this book is a fascinating, lively and entertaining account of her intertwined life with her foremost lady-in-waiting, Marie-Louise Therese, the Princesse de Lamballe. The dust jacket promises to "[immerse] the reader into a world of titillating sexual rumours, blood-thirsty revolutionaries, and hair-raising escape attempts." If this suggests that Walton is indulging more in the salacious side of the period ahead of serious study, fear not, as she has struck a winning balance between vivid storytelling and well-researched history. Non-fiction is usually at its best when the author's enthusiasm for their subject emerges clearly but yet remains tempered by scholarly study, and this is the case here. It's not really as straightforward biography of either the Princesse de Lamballe or Marie Antoinette; in truth it's more of a general picture of 18th-century France and the Revolution that swept across the nation like a firestorm during the century's final decade. Walton does a superb job of bringing events to life, and you'll soon find your attention held; it's an addictive read that's truly difficult to put down. There's a fairly substantial cast of characters here and if you're a relative newcomer to this world, you may find yourself turning back to the cast of characters that's helpfully included at the start of the book. Antoinette has been the focus of many myths, and Walton seeks to set the record straight concerning some of the more pervasive ones, such as the infamous 'Let them eat cake'. "The Queen..." explains Walton, "was not completely unaware of the people's desperate plight... The famous line often attributed to her was likely said by one of the Mesdames, although probably taken out of context". The other oft-circulated rumour that's looked at throughout the book is that of Marie Antoinette's relationship with no only the Princesse de Lamballe but the pretty Duchess of Polignac, who was Lamballe's "nemesis", managing to usurp Marie-Louise Therese as Antoinette's favourite while the Princesse was suffering from measles. Such rumours resulted in the distribution of pamphlets that "accused [Marie Antoinette] of the most repulsive, vile, and vicious acts," and contributed to the fate of both Antoinette and Lamballe. The latter's grotesque death during the September Massacres is described here in fairly graphic detail, but it doesn't seem gratuitously portrayed by Walton. One of the author's self-ascribed aims for the book was to redress common misconceptions about Lamballe, and this feels very much like a success. The book ends, as you would perhaps expect, with the execution of Marie Antoinette herself. This is history writing at its very best; vivid detail, characters colourfully brought to life and events clearly described. Anyone with an interest in French history, 18th-century Europe or the main players will find this book hugely appealing. Very highly recommended. This was a very comprehensive biography about the Princess de Lamballe. Where Walton may have spoken of Princesse de Lamballe solely and near-selfishly for the entire book, she walks freely and boldly through the French court, reframing the excess, drama, etiquette, and poshness of a royal lifestyle impeccably well. A modern reading audience can easily pick up on personality traits, scandals, woeful tragedy, and details of the French Revolution from the ease of prose and Walton's levelheaded use of pathos. Between the glamorous trivia concerning donkey races, an elaborate infamous necklace, hedgehog wigs and absurdly sounding unraveling parties; there are serious illustrations to be found of the cost of loyalty in the Hall of Mirrors and condemning public opinions. Those vaguely familiar with the name (Marie-Louise Thérèse of Savoy-Carignan), the Princesse de Lamballe are first introduced to fairy tale beginnings that can flutter from one name (or repetitive scandal and daily minutia) to the next in this work but with a little persistence a direct fascinating timeline emerges of this tragic figure of history who is remembered for her grisly connection to terrifying events of the French Revolution and the queen whose side she refused to leave at the very end. If the reader is searching for a fine easily accessible accompaniment for their 18th-century French history shelves that can encourage lasting reflections and further reading Marie Antoinette's Confidante: The Rise and Fall of the Princesse de Lamballe is definitely worth a look. This is an old-school, extremely detailed biography of the Princesse de Lamballe, whose position within the French royal family and in Marie Antoinette's favor made her an excellent target for revolutionary charges of frivolity, sexual excess and decadence (so much so that her head ended up on a stick early). Walton has done a really thorough job combing records in an attempt to rehabilitate her, but there is little analysis here about *why* Lamballe was such an embodiment of charges against the monarchy, or nods to the excellent work done about the workings of the court, like Dairy Maids, and Queen of Fashion: What Marie Antoinette Wore to the Revolution. The author hoped readers would love the book, I did. This period has so much intrigue, fashion, danger, etc. there are so many books written about it. I found this one different. Slightly gossipy, in a good way, chatty really. Masses and masses of historical research and background to learn from, you easily understand who's who. Women had no power yet much power and used it. Men were dressed in elaborate clothes but many were cruel, self serving, ruthless tyrants. Women needed close friends they could trust and spend time with. I think the author has crafted a super easy to read book am thrilled to have been able to review it. Write more please. I am a fan!